Is it just me or does anyone else get completely annoyed by those stupid "I wish I never had to scoop a dirty litter box again" commercials? I always want to scream at the TV, "Lady, one day your cat(s) will be gone and you'll wish you had that litter box to complain about again!" If you choose to have cats in your life, litter boxes are as much of a necessity as toilets are for us humans. Keep them clean and quit griping about it already! My only "issue" with kitty litter over the years is just wishing that it would last longer. I don't know how many times I've wondered if the brand I've been using for years has changed it's formula because it doesn't seem to last as long as it used to. 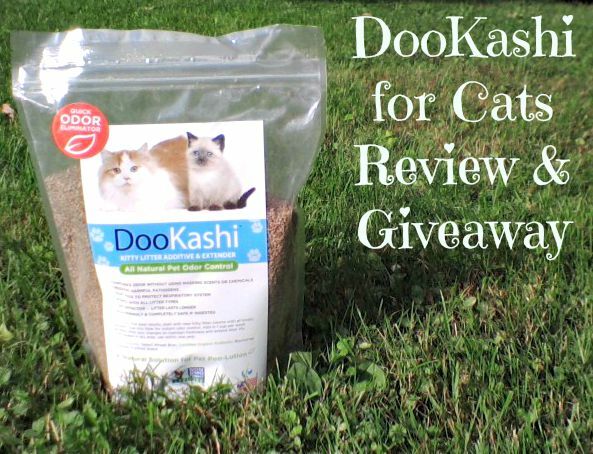 Just before losing Truffles so suddenly I was contacted about reviewing a new product called DooKashi for Cats, an All-Natural, Non-GMO Project Verified kitty litter extender and odor eliminator. (DooKashi is one of the first pet products to have this verification!). It has a whole grain oats-like texture that when added to kitty litter, removes the noxious odor of cat urine almost immediately. DooKashi works on a microbial level to eliminate odor from urine and feces without using any chemicals or perfumes. It’s 100% natural and completely safe if ingested by pets (or humans!). 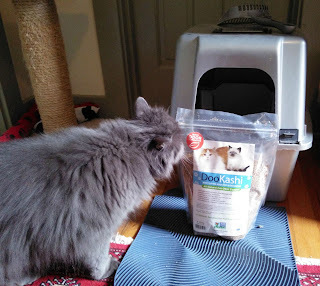 I was really excited to try it out because of it's billing as a litter additive and extender for cat boxes. Then, without a moment's notice, I found myself cat-less. 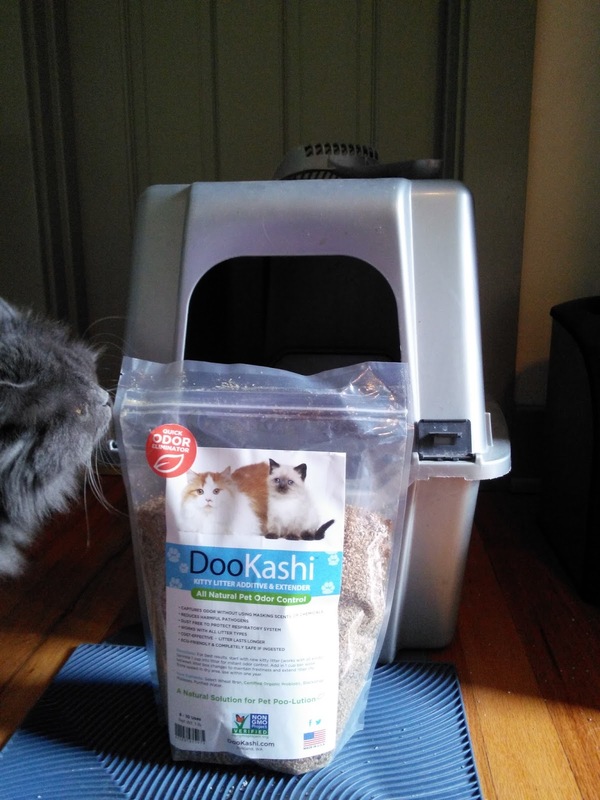 My first instinct was to put the review on hold, but then I realized that my perfect opportunity to try DooKashi would be during the 3-week cat sitting job I had lined up. Not once during that time period did I have to add more litter to the box (YAY! ), and there was no litter box odor whatsoever. The company advises that for best results, start with new kitty litter. Sprinkle 1 cup into litter for instant odor control. Add in 1 cup per week between litter box changes to maintain freshness and make litter last longer. I freely admit that I didn't use anywhere near that amount because I wanted to make sure that I kept most of the bag to use in my own home as soon as I adopt another kitty. This stuff really works! 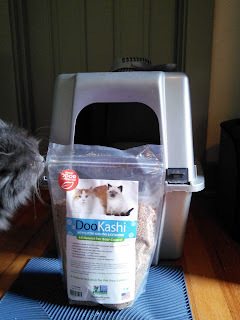 My cousin is a backyard chicken keeper and I will be recommending DooKashi to her as well, since it can also be used in chicken coops, small animal cages, horse stalls –any animal with a bedding! If you're interesting in trying DooKashi out for yourself, enter below to be one of two lucky winners who will receive a one pound bag! You can also use promo code “$5OFF” and get $5 off any order of DooKashi at check-out. Valid thru 8/16/15. Connect with DooKashi on their website, Facebook, Twitter, and Pinterest. This post is sponsored by DooKashi. I am being compensated for helping spread the word about DooKashi, but Mochas, Mysteries and Meows only shares information we feel is relevant to our readers. DooKashi is not responsible for the content of this article. Now dat sounds like sum weally cool stuffs. We hope weez get too twy it. And weez hope yous get to use it soon. Sendin' purrayers. The mom is fastidious about trying to keep our boxes clean. This sounds like something she would like to try. Sounds like good stuff. I never complain about scooping or even about cleaning Lucy's pee wherever she goes. I scoop daily and as needed, but this might help with upstairs box which I neglect. I would love something that would keep the box smelling better between changes! This sounds like something worth trying. I seem to running out of litter quicker too. With more than one cat any help with the stinkies is welcome. This sounds great, I thought that I was the only one who thought that the litter didn't seem to last as long. We've never heard of that but it sounds like good stuff! Our facilities are in a walk in closet in Mommy's home office so we have to have something that's dustless and covers odor - although of course we don't stink! Since we're pretty picky it makes it kinda tough so we'd love to win and give this a try! Thanks for the review! We know Truffles will guide another kitty into your life one of these days! Must try. Have a fosteer with terr i ble urine smell. Yes, as a matter of fact. The Precious Cat sticks to the box like cement after I do pees. It’s hard to scrape off. That doesn’t happen with the Arm & Hammer in the other box. I forgot to answe the question. We have three cats and one is particularly stinky. This is a great idea! I would love for the cat box to smell better. We'd love to try it with our stinky foster kittens! That is a terrific review. That does sound like great litter. Good info. Have a great day.. How is Mudpie?? ?